It’s Spring 2013 and I am standing in the biscuit aisle of our local Tesco with my sons, 16 & 12. I’m 48, exhausted and sobbing. I haven’t slept soundly for ages and I feel permanently anxious. I’m a working Mum, flying solo with my boys and both my parents are going through chemotherapy. After mentioning my meltdown to a friend, she suggests exercise might help me sleep and kindly gives me an indoor rowing machine that is otherwise destined for the charity shop. I haven’t exercised on a regular basis for literally decades and am a little sceptical. But she has been so generous and at this point I am literally open to anything. Within two weeks I am sleeping and life is looking so much brighter. I join a gym and find a community of rowers on Twitter who give wonderful advice and support. My technique isn’t great but I know I feel physically better and emotionally stronger. I no longer burst into tears in supermarkets! A few months later, shortly before Christmas, with my sister and my Dad, I have the heart breaking privilege of holding my Mum as she takes her last breathe. We tell her we love her and thank her for everything she has done for our family. The relief of knowing she is at peace and adrenaline rush of organising her funeral carry me through Christmas and into 2014. And then I begin to crumble – inside. On the outside, I am still juggling everything well – looking after my Dad, my sons and being a supportive sister, whilst also working and keeping up with simple life admin. But inside I feel like I am drowning in grief. My technique isn’t great but I know I feel physically better and emotionally stronger. I no longer burst into tears in supermarkets! I’m incredibly fortunate to be offered bereavement counselling with a local charity. My Mum played a huge part in our lives and I feel overwhelmed at the thought of helping my sons navigate the future without her. I am hopeful I will learn ways to support them and my Dad as well as myself. What happens during counselling however surprises me. As well as talking about Mum, I find myself sobbing as I discuss my miscarriages (some 19 and 10 years prior) and the end of my marriage. Like bereavement, these are moments of loss when life brings you to your knees and the future you hoped for is shattered. Times when there is an imperative to rebuild and move forward whilst the very ground beneath you feels so unstable. When your heart and soul feel broken and you wonder how your legs will carry you through the next 24 hours. I am confused by what is happening and apologise profusely that I am taking up his time on the wrong topic. He simply encourages me to continue. I realise that I have never really spoken about my miscarriages, the sadness and the worry that I had done something wrong to cause them. We didn’t have social media or online communities 20 years ago. There was no support system in place and it was something many women simply remained silent about. Even now in 2018, miscarriage remains a taboo subject. This is despite the fact that among women who know they are pregnant, it is estimated that 1 in 8 pregnancies will end this way. What’s more, I had always felt guilty if I did mention them. I have two healthy sons. Reflecting on my loss when I have so much to be grateful for has always felt selfish. I had pushed the grief aside and papered over the pain. Mum’s death had now cracked open my heart and the sadness came tumbling out. He asks what might help me. “I need to sit down and row to the shore” I reply. Of course I mean it metaphorically, but within it there is a spark of an idea. Three weeks later, with almost no preparation, I set up a Just Giving account and launch a fundraising challenge ‘Million Metres and Marathon for MacMillan Cancer Support”. My goal is to row a million metres and then a marathon to raise £4,219.50 (a marathon being 42,195 metres) in memory of my Mum and to thank the MacMillan Cancer Nurses for everything they have done for both my parents. I start on the 5th May, my parents’ wedding anniversary and for 8 months, row 10,000m every other night after work. On the 21st December 2014, the 1st anniversary of her death and 5 days before my 50th birthday I row 26.2 miles on an indoor rowing machine in front of family and friends. We raised £10,000 including Gift Aid. The support I receive from the rowing community on Twitter is extraordinary, complete strangers donate to my fundraising, local and regional newspapers and radio share my story. I am overwhelmed by kindness. My friends comment upon how I have abs of steel, how I walk taller and my eyes smile with purpose. For me though, it is my mental and emotional wellbeing that has experienced the greatest change. I am deeply grateful for the opportunity the rowing challenge gives me to find a way through my grief. Sometimes I sob (in the middle of the gym), other times I smile as I recall moments we shared. At other times I give myself permission to simply switch off from the world. I realise now that the very process of rowing was my way of moving the grief that had settled so deeply into my bones over the years. I was replacing it with joy, peace and gratitude for the love and life we had with Mum. Turning our sadness into something positive and life affirming, helping someone else facing a cancer diagnosis. I was rowing to raise funds and I was rowing back to myself. In the years since, I have continued to make exercise part of my life and how I handle the every day. I have taken up running, completing Couch to 5k in December 2017 for the first time and have set myself a goal to run 1000km in 2018. I’m also a keen plogger, picking up litter as I run. I have returned to my love of the sea with bodyboarding, wild swimming and stand up paddleboarding. I cartwheel and do headstands on the beach. I dance in the hills when my legs don’t feel like running. I lift heavy things at the gym and flipping a huge tyre has become fun. 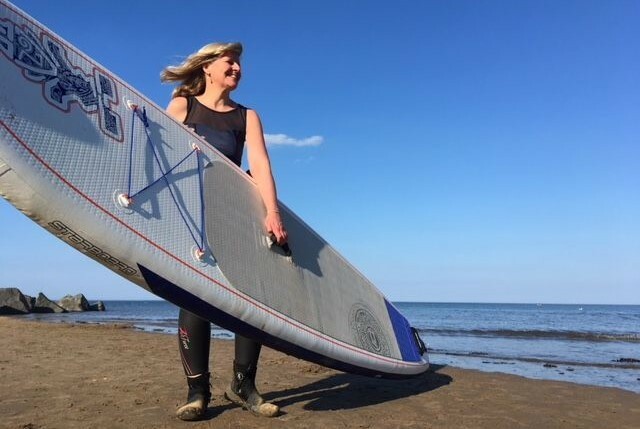 After damaging my knee with a fall and developing a frozen shoulder, I promised myself surf lessons – a lifelong dream. This summer, for 4 glorious seconds, I stood up and rode a wave. I screamed with joy all the way. I will never be the fastest, the strongest or most accomplished. I rarely enter races and the closest I get to thinking about my pace is checking my time after Parkrun. For me, exercise is about something else. Movement has given me something that lifts my heart. A place of peace and possibility – for the past, the present and whatever the future holds.